It seems that everyone starts their hacking career cracking WiFi. We hope that these tools go someway to helping you understand how to crack and secure your WiFi network. WiFi (‘Wireless’) hacking is all the rage. For reasons best known to psychologists it seems that WiFi Hacking is the most popular ‘hacking related content’ on YouTube. Some WiFi Hacking Videos on YouTube have literally millions of views. Perhaps Hacking WiFi is so popular because, firstly, it means that if you master the attacks you’ll be able to secure endless free WiFi, but, secondly, because it is something which appeals an a ‘rite of passage’ for any budding wanna-be Hacker or serious Cybersecurity Professional. Needless to say, to Hack WiFi is an achievement (if it has been configured absolutely correctly using for example WPA2 Enterprise) and the skills required to defend against such attacks are highly in demand, so to satisfy your curiosity we’ve gone ahead and listed a bunch of WiFi Hacking Software Tools that the Interwebs seems to have fallen in love with! What is Fern WiFi Wireless Cracker? Fern Wifi Cracker is a Wireless attack software and security auding tool that is written using the Python Qt GUI library and Python Programming Language. This tool can can recover and crack WPA/WEP/WPS keys and can run other network based attacked on ethernet or wireless based networks. Is Fern WiFi Wireless Cracker Free? Yes Fern Wifi Cracker is free of charge. Does Fern WiFi Wireless Cracker Work on all Operating Systems? 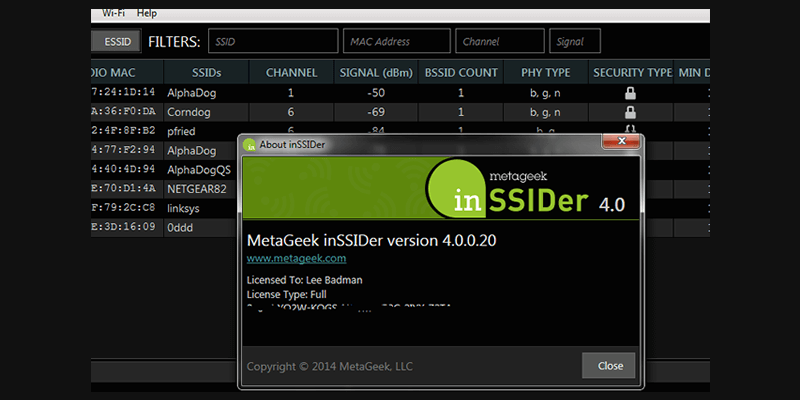 This works on Kali Linux operating systems. 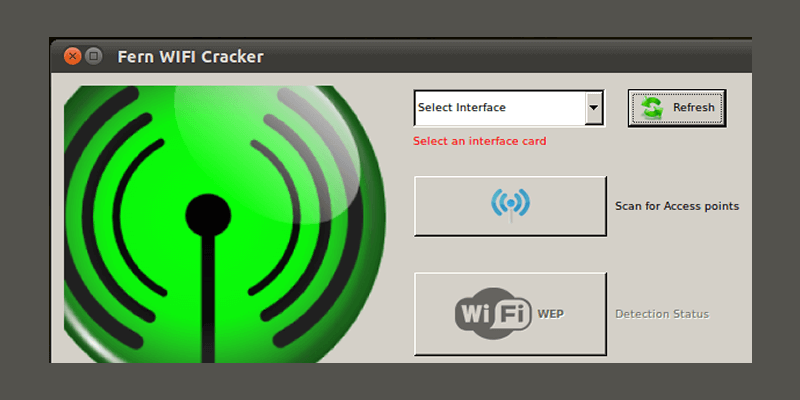 What are the Typical Uses for Fern WiFi Wireless Cracker? This tool helps in assisting with Network security by enabling the user to view and discover network traffic in real-time and therefor can identify the hosts and network data discovery. With the network server data features, it will help toughen your server and discover vulnerabilities before they are exploited. We’ve previously reviewed this tool here. 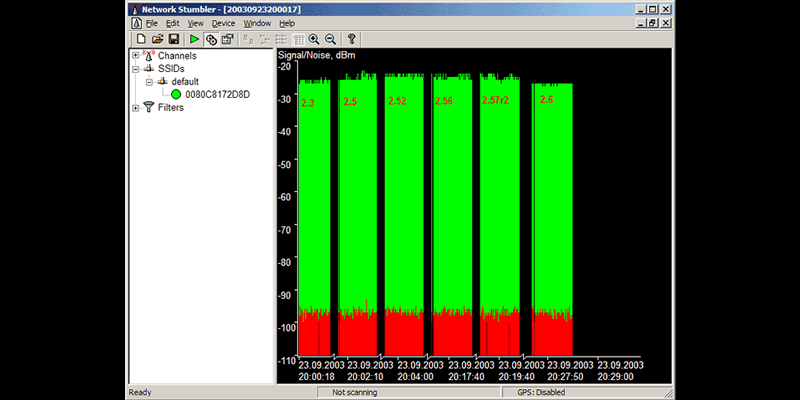 Netstumbler is one of the well-known Windows tool for finding open wireless access points. They also distributed a WinCE version created for PDAs and named it MiniStumbler. Netstumbler uses a more active approach in finding WAPs than other tools. The last time we checked NetStumbler didn’t seem to have been updated – but we could be wrong! If we are please go ahead and drop a comment below – we and our community would really appreciate it. Yes, this tool is free but no source code is provided. Does NetStumbler Work on all Operating Systems? Netstumbler is a Windows-only tool. What are the Typical Uses for NetStumbler? 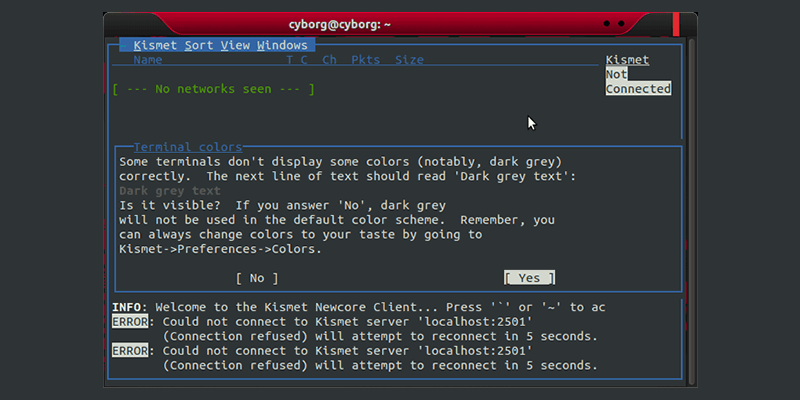 Netstumbler is commonly used for Wardriving. Finding locations with poor coverage in WLAN. Verifying network configurations. Helps in detecting causes of wireless inteference. Detects unauthorized access points and aiming directional antennas for long-haul WLAN links. 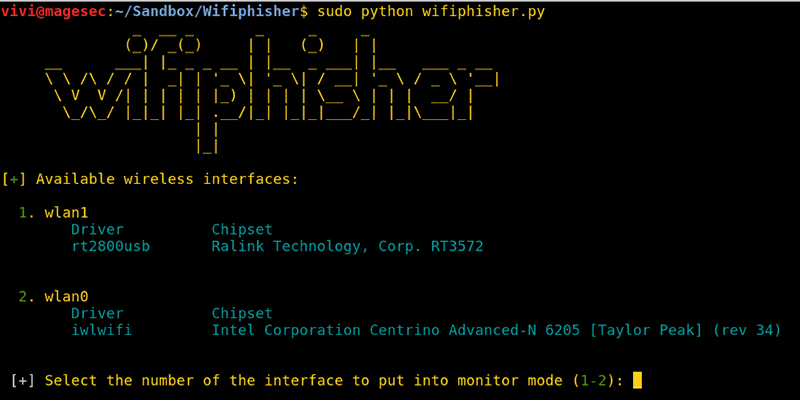 Wifiphisher is a WiFi hacking tool that can execute speedy automated phishing attacks against Wireless/ WiFi networks with the intention of discovering user and password credentials. The difference with this wireless tool (compared with the others) is that it launches a Social Engineering attack which is a completely different attack vector to take when attempting to breach WiFi networks. Yes. This WiFi ‘cracking tool’, as it is often referred to – is completely free and available from GitHub. 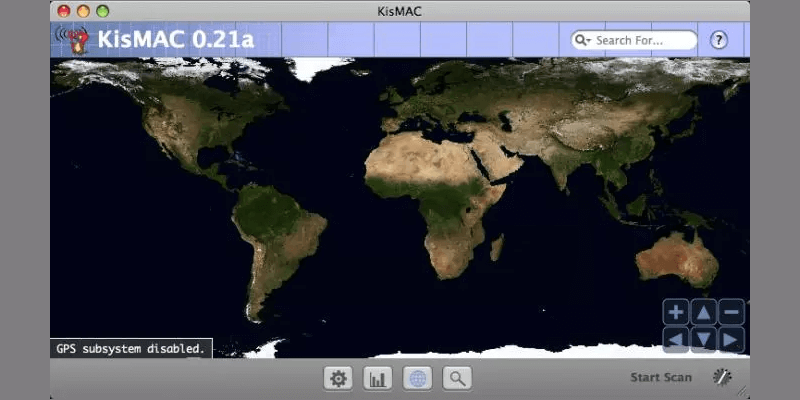 Does Wifiphisher work on all Operating Systems, and what are the requirements? 1. Kali Linux is the officially supported Linux distribo, but according to the developers GitHub page some users have been able to get the framework to work on other platforms. To be safe though we’d always recommend trying it either on Kali and almost certainly Linux since that is where you’ll get most support. 2. You’ll also need a wireless network adapter that supports ‘Access Point’ (AP) mode; and your driver should also support netlink. 3. Wireless network adapters are required that can be placed in ‘Monitor Mode’ and that are able to perform injection attacks. What are the Typical Uses for Wifiphisher? Wifiphisher can be used to a crack WiFi password. This tool takes the following steps: Wifiphisher deauthenticates the user from their legitimate AP. The framework then allows the user to authenticate to the Evil Twin AP that must be setup for the attack to be successful. Wifiphisher will then offer an HTML webpage to the user on a proxy that will notify them that an upgrade on the firmware has taken placed and will ask them to authenticate again. The wifi password is passed to the hacker while the user will continue browsing the web not knowing what happened. I’d love to help but I can’t think of anything from the top of my head. I’ll approve your comment here in the hope that someone else can chime in and offer some advice and/ or help. Good luck! Is there any perfect WiFi cracker for android devices? If you mean using an Android to crack WiFi then perhaps taking a look at aircrack but I’m not sure if it can run on Android. Is there any good WiFi hacking tool available for Termux or android? I am referring to For WPA/WPA2? The answer is that I’d don’t know. I’ve published your comment in the expectation that someone else can chime in. I want to hack a WiFi network but I can not hack, it shows that there is an authentication problem. Please help me to hack, how can I hack the WiFi network using my android mobile? What kind of encryption is WiFi using? What attacks have you tried? Are you only using your mobile to facilitate the attack? If it is then I think you will have limited success. I need an application that works perfectly with windows 10 for cracking WPA2-PSK passwords. I’d take a look here if I were you.